Grub Street does not exactly enjoy calling out John Mariani, the Esquire restaurant critic with a mixed reputation in the industry. For one thing, any coverage of him is followed soon after by a complaining email from Mariani. For another, by now, pointing out flaws in a Mariani story is like pointing out plot holes in Pacific Rim — obvious. But his post today about the decline of modernist cuisine in the U.S. is so riddled with inaccuracies, it’s difficult to believe Mariani isn’t just trolling everyone for the sake of follow-up coverage. Nevertheless, the fun to be had from breaking this story down is too much to ignore. Let’s do this, line by line, Fire Joe Morgan-style. Now celebrating its tenth anniversary, the 17-seat Minibar in Washington, D.C., has received every award possible. Last year, its chef José Andres was named by Time as one of its 100 Most Influential People in the world. This year, the President and Mrs. Obama celebrated Valentine’s Day there. With all that success, you’d think that the molecular cuisine Andrés is selling would take the nation’s capital, and the rest of the nation, by storm. 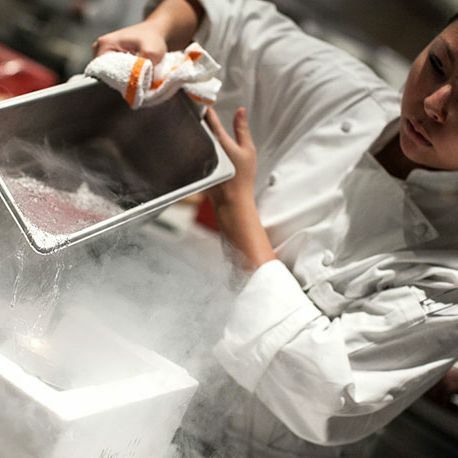 But the fact is, despite tremendous media hype — not least the specious 2013 San Pellegrino Awards that ranked six restaurants specializing in molecular gastronomy in their top ten — the expansion and influence of that avant garde cuisine has been next to zero. So: aside from dominating a restaurant list that, specious or not, is one of the most influential in the world— high placement means a restaurant will completely book out a year in advance — restaurants “specializing in molecular gastronomy” aren’t doing so hot. Especially in the U.S., the movement has barely budged beyond its first breakthrough in 2003 at Wylie Dufresne’s wd~50 in New York and in 2005 at Grant Achatz’s Alinea in Chicago. The rest of the molecular restaurants in the U.S. can be numbered on the fingers of two hands: Schwa, Moto, and Grace, all in Chicago; Atelier Crenn in San Francisco; the Pass in Houston; Catbird Seat in Nashville, and one or two more that are struggling to stay open. In New York, Atera, Eleven Madison Park, and Chef’s Table are using minimal modernist techniques. Not much to show after ten years of evolution and hype. Here is a barely-scratching-the-surface list of restaurants that also employ “modernist techniques”: The Bazaar by José Andrés (two locations — perhaps these are the places Mariani thinks are “struggling” to stay open? ), Chicago’s Graham Elliot, Alder (which Mariani dismisses later, but we’ll get to that), Next (also dismissed, also in Chicago), Corton, Betony, Coi and Benu in San Francisco, Root in New Orleans, and Chicago’s El Ideas. Two decades after Ferran Adrià mightily coaxed foam from carrots at El Bulli in the Catalonian mountains, his restaurant has been closed for three years, and his modernist razzle-dazzlements are few and far between in American restaurants: smoldering cinnamon sticks (Alinea); hay-infused yogurt with chamomile and puffed rice (Catbird Seat); edible menus (Moto); smoked banana pudding (Grace); or oysters with liquid nitro pearls of smoked sturgeon set on top of rocks (Atelier Crenn). Yes, some of them fill their tables most nights they’re open, but if you tallied up all the seats at all those restaurants, you’d have fewer than one night’s seatings at any branch of Smith & Wollensky’s. Yes, if you take that very small sampling of high-end restaurants that specialize in serving expensive, hours-long experiences to a limited number of people (the places on Mariani’s list total 246 seats by Grub Street’s count), you could make the argument that they serve fewer people in a night than a high-volume chain steakhouse. They also serve fewer people than any one McDonald’s, or any one IHOP, or probably even Paula Deen’s buffet in Savannah. It’s apples and oranges. Who cares? Dinner’s signature dish is paté that’s encased in a gel designed to make the whole dish look like a piece of fruit — a modernist trompe l’oeil — but the restaurant isn’t even in America so why is it relevant? Next did an entire El Bulli menu that sold out completely. But — sigh — this keeps going. This is when you start to suspect that Mariani himself can’t possibly believe this. Here is a sampling of a “few” more nods toward “molecular tactics” at Alder. Rye pasta with molecular pastrami; ricotta that’s made out of coconut milk (a technique made possible by agar); quail turned into a column with an enzyme called transglutaminase; or even pub cheese that’s served with flattened, dehydrated Martin’s potato rolls. So, you know, just a couple of things. And when Vegas came calling for ideas from Andrés, he didn’t dispatch the Minibar team there. Instead, he opened Jaleo, a traditional tapas restaurant, and China Poblano, a fusion joint. He did indeed open those spots. But Andrés also operates é, a small bar that specializes in multi-course modernist meals. Just like Minibar! Vegas isn’t the only place that isn’t ready for the Minibars of the world. Young, food-obsessed hipsters — who get positively piranhic for everything from bone marrow to Cronuts — never really took much of an interest in molecular gastronomy because of the exorbitant price tag. And home chefs have been hard-pressed to adopt the cuisine because it is so time-consuming and difficult. Setting aside the fact that the top-secret cronut-making technique employs at least one modernist sleight of hand, let’s address the assertion that home chefs haven’t adopted modernist techniques at home because “it is so time-consuming and difficult.” That description also applies to every other cooking technique employed at high-end restaurants. Here are some other non-modern restaurant techniques that most home chefs have been hard-pressed to adopt because they are both time-consuming and difficult to do well: Dry-aging, cooking in a tandoor oven, cutting vegetables in a brunoise, making veal stock, cooking foie gras terrine, preparing sushi, making tortillas from scratch — the list is endless. I’d estimate that 99 percent of America’s finest chefs admire the innovations of molecular gastronomy, and many have probably bought the six-volume, $625 book Modernist Cuisine by Nathan Myhrvold hailed as a culinary landmark. But they have ignored all the liquid nitro machines, syringes, and centrifuges required. Not a few have called modernism out as a passing fad. They are too busy reconceiving more traditional culinary genres that will happily appeal to most people: Chef Michael White (Marea, Ai Fiori) has just opened an Italian steakhouse called Crostata and a Wisconsin-inspired supper club named The Butterfly in New York; Ming Tsai (Blue Ginger) has opened an Asian gastropub named Blue Dragon in Boston; Mike Lata (Fig) debuted a Southern seafood house called The Ordinary in Charleston; Ford Fry (The Optimist) is doing down-home American at King & Duke in Atlanta; Stephan Pyles (Stephan Pyles) is focusing on Texas cookery at Stampede 66 in Dallas; and Michael Cimarusti (Providence) is doing a seafood shack in L.A. called Connie & Ted’s. No one is doing modernist cuisine. Yes, there are other chefs that open other kinds of restaurants. That does not mean that modernist restaurants don’t exist. As for the claim that “no one is doing modernist cuisine” one simply needs to refer back to any of Mariani’s eight previous paragraphs — in which he lists plenty of restaurants “doing modernist cuisine” — to see that the statement makes no sense. And where on the horizon is the next Minibar? If you know of any, clue me in. Just don’t invest in one; most lose money. As someone who has, over four decades, seen culinary fads come and go and “revolutionary” concepts crash and burn, I don’t think M&M; restaurants are where the smart money is going. Well, the current Minibar totally revamped and just reopened in November with more seats, so it seems the “next” Minibar arrived only eight months ago. It might be a little soon to start asking about the next next one. The idea seems to be that modernist cuisine is dying in America because at this exact moment Mariani can’t pinpoint a new restaurant that will do what Minibar already does. In fact, the truth is that modernist techniques have become such an important part of any high-end restaurant kitchen — sous-vide cooking, newfangled clarification techniques, modernist thickeners for sauces and gels — that even restaurants that seem un-modern on their surface are nevertheless using the ideas Adrià, Dufresne, Achatz, and others pioneered and popularized. To downplay their continuing influence isn’t just wrong, it’s willfully ignorant of what’s actually happening in contemporary restaurants.